Ismaël Omar Mostefai and Abbdulakbak B. have been identified as two of the eight attackers who launched a deadly rampage in the French capital, killing at least 129 people and injuring more than 350. Ismael was reportedly identified from a fingerprint from a severed finger of one of the suicide bombers, French media reported. The father and brother of Ismael, who is a French national, were being held by authorities on suspicion, according to reports. All eight attackers have been killed, reported the Associated Press. At least seven of the militants died in suicide bombings. It was reported that when French authorities stormed the Bataclan concert hall in Paris, terminating a hostage situation involving more than 200 people, three of the gunmen detonated suicide belts, killing themselves. Gunmen held the hostages for more than two hours, as gunfire and bangs could be heard from outside. About 100 people were executed at the Bataclan, Agence France-Presse reported. Some of those held hostage tweeted pleas for police assistance from inside the concert hall. The assailants were all men and were not masked at the time of the attacks, the Los Angeles Times reported. Authorities said there were several sets of attackers involved in Friday's attacks. "Two or three individuals not wearing masks returned with automatic weapons of the Kalashnikov type and began to fire blindly into the crowd," said a Europe 1 journalist who was at the Bataclan concert hall. "The attack lasted about a dozen or 15 minutes. It was extremely violent, and there was a wind of panic, everyone was running around and there were scenes of trampling. The assailants had time to reload at least three times. They weren’t masked, they were masters of themselves. They were very young." 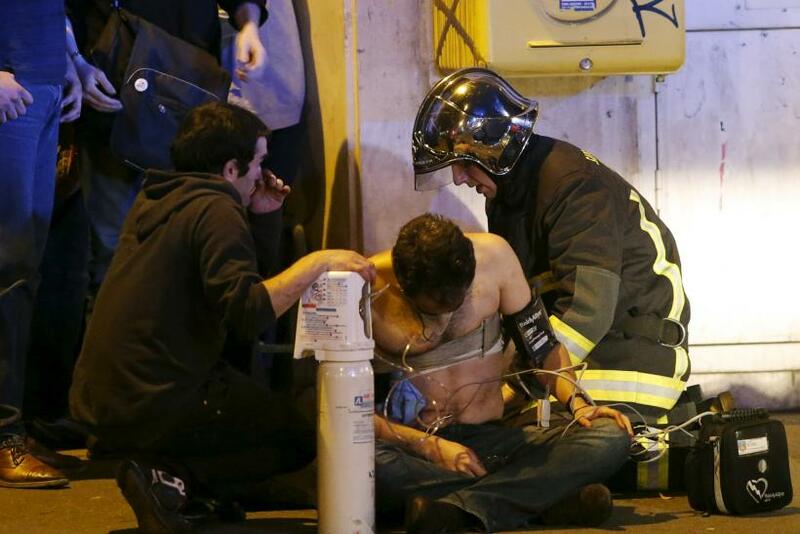 The series of attacks that gripped Paris began after two explosions were heard outside the Stade de France stadium. Earlier in the day, the German soccer team had been evacuated from a Paris hotel early Friday after a bomb threat, according to the Guardian. There were also shootings at three different restaurants in central Paris that left 39 dead. France declared a state of emergency across the country Friday evening. The country has since closed its borders.